Requests for Product Exchange must be made within 30 days of date of purchase. Most products are eligible for exchange however there are some product exclusions (see listing below). We recommend contacting us before placing your order to make sure you are ordering the correct product size and if the product is eligible for our exchange program. Customer is responsible for paying shipping costs back to our warehouse and original shipping costs are not refundable. We reserve the right to deny any product exchange which appears to abuse our policies. See Return Policy below for more details and exclusions. Requests for product returns must be made within 30 days of date of purchase. After that time period the sale is considered final. We highly recommend contacting us before placing your order to make sure you are ordering the correct product/size and if the product is returnable. Customer is responsible for paying return shipping costs and original shipping costs are not refunded. A restock fee of 20% applies to all returns. Refunds for items that were shipped under a Free Shipping promotion will have the original shipping cost deducted from the material cost to be refunded. If an order benefited from a volume or bulk discount which would now not apply due to the returned quantity, the refund will be reduced by any difference in pricing. Refunds will be issued only for products that are received back in original unaltered conditon. Any products that show signs of use, wear, or missing accessory items will be discarded and a refund will not be issued. We reserve the right to deny any product return if there appears to be a blatant abuse of our return policy. Any material returned without an approval and a RAN# will not receive a refund. Credit is issued to the credit card/PayPal account used for the order. Special Order Items: Any product that is special ordered from the manufacturer or direct shipped from a manufacturer's warehouse is not returnable. Asbestos Abatement Related Items: Our warehouses have strict policies that do not allow them to accept any returned materials that have any chance of being within the proximity of asbestos containing materials (including Rewettable Cloth). Please do not send back any products that are listed under the Asbestos Removal categories on our site. Please check with us before ordering a product from this category. Insulation Board Products: (Fiberglass and Mineralwool), these products take a beating during shipping. By the time it gets back to us they are not in saleable condition. Guilford of Maine Fabrics: These products ship direct from the factory and cannot be returned to our warehouses. *There will be no exceptions to the policies listed above. Same Day Shipping applies to orders placed before 3pm (EST) Monday through Friday. Orders placed after 3pm will be shipped the following day. Orders placed over the weekend or on a holiday will be shipped out on Monday. Orders containing special order items or non-stock items will not be shipped out the same day. Order containing a backordered item may be delayed shortly as well. - Orders that contain a special order item / backordered item, we will do our best to get these orders out asap. *Please note that although we pride ourselves on our fast shipping, we do not guarantee same day shipping. Certain situations happen where we are unable to get all orders out on time or UPS may not pickup. Same Day Shipping means that we will ship out your order the same day, not that your order will be delivered the same day. UPS Ground shipments will be delivered from the next day up to 5 days. *Please contact us if you have any questions regarding our Same Day Shipping policy. NEXT DAY AIR SAVER- Will be delivered the next business day (Commerical addresses and Residential addresses will receive delivery by the end of the day). **Please keep in mind that Saturday is not a business day for UPS, so orders shipped on Friday will be delivered on Monday (next business day) if you need Saturday delivery, please call us so we can select that option and provide you with the extra shipping cost. 2ND DAY AIR - Will be delivered in two business days by the end of the day. **Please keep in mind that Saturday is not a business day for UPS, so orders shipped on Thursday will be delivered on Monday (2nd business day) if you need Saturday delivery, please call us so we can select that option and provide you with the extra shipping cost. UPS / FedEx GROUND - Delivery in 1-5 days depending on location. Please contact us and we will provide accurate shipping times to your address. * We reserve the right to not ship orders for any reason. If we choose not to ship your order a full refund will be provided. * Orders can be canceled by the customer up until the time the order is shipped (Shipment Confirmation E-mail will be sent). Once the order is shipped in our system it can no longer be altered or canceled. * BuyInsulationProducts.com ships to the ship to address provided by the customer. If for any reason the package is returned to one of our warehouses due to the incorrect address being provided by the customer, additional shipping costs to reship the package to the correct address will be charged. Please make sure the address provided is accurate to avoid these mistakes. If the package(s) were unable to be delivered by UPS for reasons caused by the customer or their location, additional shipping costs must be paid to reship the material. * BuyInsulationProducts.com assumes no responsibility or liability for the use of Insulator Knives. The buyer should research the local and state regulations regarding the legality of posession of such knives before purchase. * If an item does not specify the manufacturer of the product in the store, a customer must contact Buy Insulation Products.com and ask for manufacturer data before placing the order. We can get you any datasheets or MSDS sheets you need for your job submittal, etc. * All item prices are subject to change, however customers will be notified of any price changes relating to an order before shipment. * Retroactive Sale Pricing or Discounts will not be applied to orders once they are placed. * Credit Cards that do not have matching billing addresses are not accepted by BuyInsulationProducts.com and the orders will not be shipped. * It is strongly recommended to wear respiratory equipment for any of the fibrous products sold on our site. (especially when cutting the products) The use of goggles, long sleaves, and gloves are also recommended to avoid irritation to the eyes and skin. Please contact us regarding the MSDS forms for any of the products on our site; we will be glad to email them to you for reference. Please contact us if you have any questions regarding the safety equipment you should use for each individual product. 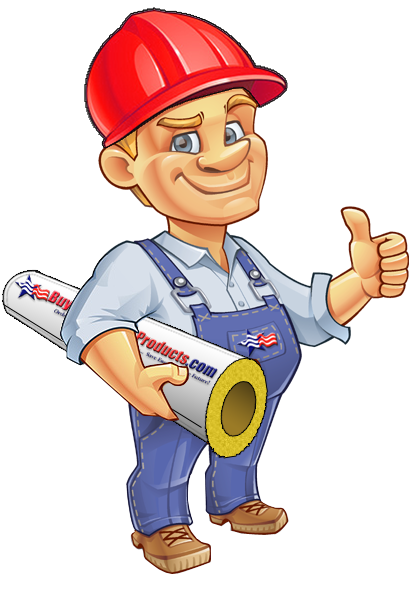 We offer the Professional Insulator Kit which is highly recommended when using fiberous products.